A Visio developer asked me if it is possible to get the name of connection points that a connector is glued to in Visio. Well, it is not possible directly from the ShapeSheet, but is easy if you use a little code. First of all, I created a simple Block shape with 3 named connection points on either side of it. I added a little text to the block to display the shape name, and to remind me where the named connection points are. I then added some VBA code into the ThisDocument class of the Visio document. Note that I am using WithEvents for this example, but in real life you should not use it because it is too chatty … you should use AddAdvise instead. By default, a Visio document comes with a Document object that has events, and I have used the DocumentOpened and PageChanged events to set a new m_page object. The m_page object has the ConnectionsAdded and ConnectionsDeleted events in order to update the text of the connector shapes. I have also included two sub routines to StartCode and StopCode, for debug purposes. Note that a connector shape can be connected at none; one or both ends, and that it can be connected to a connection point (Static Glue) or to a shape (Dynamic Glue). In addition, a connection point row does not need to have a name, so I just display the row number (zero based). Note that the screenshot above is from Visio 2013 … you can tell because the ends of the connector shape are green when you are about to connect … in previous versions of Visio, it was coloured red (this confusing some users who thought red means a warning). In addition to this functionality is there any way to populate the shape data from the connectors? I really enjoyed the post on connectors–so much so that I have been trying to walk through it on my own. Unfortunately, I am not able to even generate the block shape with the names connection points. 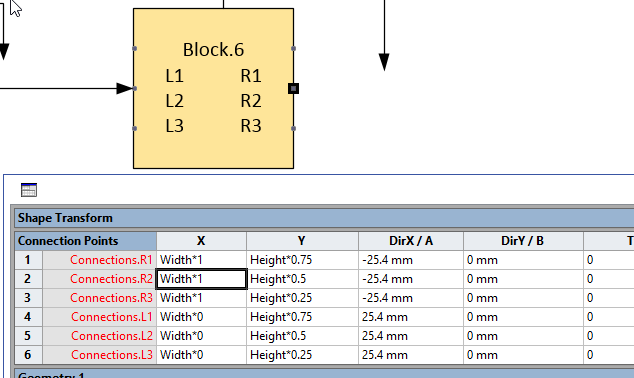 How do you name connection points and display then on the block? I tried your VBA, and it worked very well! I am not a programmer, so I do not understand everything you did, but I have an idea to use this method to be able to make a signal report based on the shape data in all connectors on a drawing. I therefore wondered if there was possible to add the connected shape information (From/To) into a connectors shape data? That is, a “From shape” and a “To shape” shape data. I’m very new to programming with Visio and I would like to know how you implement this code? It will be very useful for me! Would there be a way to change the colour of the line based on what the text inside the cell is? Can you do an example implementing this with AddAdvise? 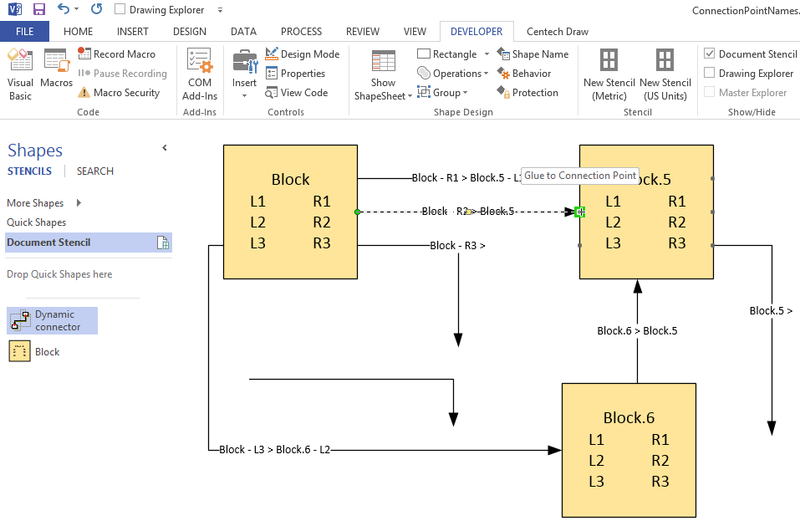 Hi David, can this be easily modified to run with Visio 2010, request you guidance. Thanks!